Get first look, the poster of Vishwaroopam II film. This is an upcoming spy thriller film, written and directed by Kamal Haasan and it the sequel to Vishwaroopam (2013) and features himself alongside Rahul Bose, Pooja Kumar and Andrea Jeremiah. The film is releasing in three languages Tamil, Hindi and Telegu. Aamir Khan will be launching the Hindi trailer of this film. The official first look of the film was released on May 2, 2017, and the film is set to release in 2018. The Hindi version of the film will be presented by Rohit Shetty and Reliance Entertainment. 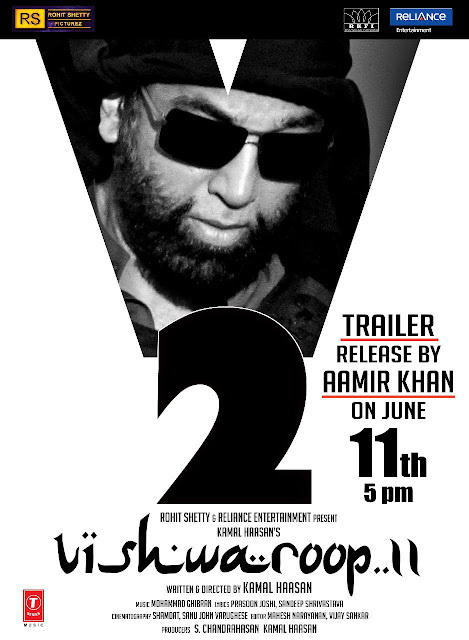 Aamir Khan to launch the Hindi Trailer of Kamal Haasan's Vishwaroopam 2 on date 11 June 2018. Initially, Vishwaroopam II was scheduled to release on August 3, 2015, but due to delays, Kamal Hassan has changed the date.